Raoudha nilometre in Cairo is part of the Tentative list of Egypt in order to qualify for inclusion in the World Heritage List. 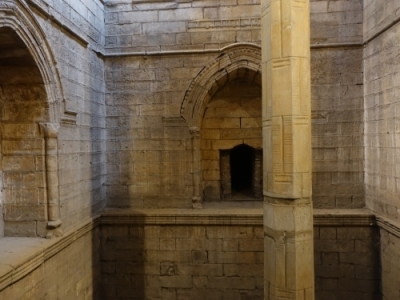 The Raoudha nilometer in Cairo has been part of Egypt’s Tentative list since 2003. I have no idea whether the country has plans for ever nominating it, but it is an easy and worthwhile addition to any city trip of Cairo. Nilometers were used since Pharaonic times to measure the Nile River's water level during the annual flood season. On my previous trip to Egypt, I already had visited 3 of them: in Edfu, Kom Ombo and Aswan respectively. This one in Cairo however is much more elaborate and decorated. It dates back to the 8th century and was renovated a few times after. After I spent 2 hours in Coptic Cairo, I left the touristy area behind me. At the other side of the Mar Girgis metro station, at the other side of the Nile even on Rhoda island, lies this Nilometer. I had to do some typical Cairene city walking to get there: from the street with the Coptic churches, I passed the military roadblock guarding the entrance, crossed the railway tracks via a walkway (with a typical dumping ground at the bottom of the walkway), walked through a shabby but still cosy neighbourhood with dilapidated high-rise buildings and then had to cross a very busy road. Fortunately there is also a bridge over the road, although I was the only one using it – the locals just crossed the road between the cars. I ended up on the banks of the Nile, at a footbridge. At the other side of the bridge some boys were playing football and they asked me "Are you going to the Oum Kalthoum Museum?". I said yes, because on the grounds of that museum (dedicated to an Egyptian singer) lies my goal: the Nilometer. At the museum entrance the guards immediately knew that I came for the Nilometer and not for the singer. They pointed me to a woman on a garden chair selling tickets for 20 Egyptian pound (EUR 1.25). A man with the key was then called to bring me to the building with the measuring station. At the tip of the island, in a corner of the museum garden, lies a small conical building. After entering, what you see is a 13 meter deep pit with an octagonal column with markings in the center. The water used to flow in here via channels from the Nile. By going down a stone spiral staircase you can reach the bottom of the pit (the channels have been closed since long, so the interior is devoid of water). The pit’s walls are decorated with arches and ribbons. There are even Arabic texts on the walls, apparently the oldest that are left in Egypt. If you look up from the bottom, you can see a magnificent dome that has been placed over it in Ottoman times. The marker was divided into 19 ‘cubits’ (half-meters), an ideal water level would be 16 cubits but 18 would mean floodings and 12 hunger (well-explained here). Overall, I found it a really fascinating instrument and it is also in excellent condition. In its description, Egypt markets this site as a “masterpiece from Islamic architecture”. But I rather would like to see it inscribed together with the older Nilometers across the country – as this is a typical Egyptian cultural product. There are lots of interesting stories attached to them, such as priests that used the ‘mysterious’ instrument to predict the future for the farmers. It was also an important instrument for determining the taxes.